Editor Emeritus Mike Silverton contributed to the print bi-monthly Fanfare first as a columnist and later as a reviewer for about a dozen years before he proposed to Madrigal Audio Laboratories that they sponsor an Internet music review. Thus La Folia. (The sponsorship ended with Madrigal Labs’ demise. La Folia has since operated absent sponsorship or ads.) In addition to having contributed articles to Stereo Review, The Absolute Sound, and most recently, StereoTimes.com, Silverton produced poetry readings for Pacifica Radio (WBAI, KPFA, KPFK), WNYC and the New School for Social Research dogs’ lifetimes ago. His own poetry has appeared in anthologies compiled by the late William Cole, poetry mags, Harper’s and The Nation. More recently Silverton has shown his art at Aarhus Gallery, Belfast, Maine, and the Center for Maine Contemporary Art. A two-CD set, Analogue Smoque, Pogus 21029-2, features Silverton reading his texts to musical accompaniments by Tom Hamilton and Al Margolis. Silvertonresides with his wife Lee, an artist, in an 1842 town house on the coast of Maine (in which Jefferson Davis spent a night in 1854). Text Editor Walt Mundkowsky was born 1944 in San Antonio, TX. As a teenager, he had a dachshund named after Hugo Wolf. Extensive writings on film (cf. his “Cinema Obscura” column in Home Theater, 1995-2001). He favors the mine-shaft approach to music listening — in-depth exploration of tiny, unrelated areas. A resident of Beverly Hills, he has lived in basements in Denver, London and Stockholm, and may very well do so again. Dan Albertson has written for La Folia since 2004. He is active in endeavors that involve language, lexicography, music, musicology, poetry, and translation. He never attended university and savors the liberty of being betwixt and between pigeonholes in life and in music. He is the founder and director of the Living Composers Project since 2000, has contributed to a variety of American and European publications and has edited multiple volumes of the British journal Contemporary Music Review, on the composers Helmut Lachenmann, Earle Brown and Aldo Clementi, plus two volumes on modernism and the string quartet. He has been a member of its editorial board since 2014. He collaborates with Cybele Records in Düsseldorf and has contributed notes to various other labels. His poems are often very short and static in nature. Ellen MacDonald-Kramer is a Canadian writer, editor, opera historian, and classically trained soprano based in the UK. She completed her MA and BFA (Hons.) degrees in in music at York University, Toronto, where she studied voice with renowned mezzo-soprano Catherine Robbin. Ellen loves baroque and classical opera, and is particularly interested in castrati. Other pleasures include secondhand bookshops, Tudor history, cats, red wine, cream teas, and genealogy. She also writes fiction and is currently finishing a novel. Fabulon Nipoupski, sole survivor of a folie-à-deux, resides in an undisclosed location with five borzois and one Komodo dragon. Ethelbert Nevin, a retired technical draftsman, resides in a quiet New England backwater. Currently translating a novel about Continental pinsetters, Nevin longs for the days when music didn’t try to please everybody. Irving Washington is the nom de guerre of a munitions gourmand who breeds chupacabras. Howard Grady Brown is a poet, playwright, pilot, printer and lover of classical music. Howard’s wife Anita is a retired singer and voice teacher. She and Howard lived in New York City for 22 years. Howard has had plays produced off Off-Broadway and on television. He regularly contributes poetry and criticism to several websites and has published a chapbook, Cobb Lane, as a companion to his brother Larry Allen Brown’s CD of Celtic-styled pieces for solo guitar and small ensemble. In 2009 Howard published Attitudes of Flight, a book of poems dedicated to his wife, who died ten months after they moved to Florida in 2008. It is available at Amazon.com. Howard’s play, The Lady Swims Today, opens March 24, 2011, at the Arena Theatre in Texas City, TX — for those in the Houston area who might be interested. Starting in an alcohol-free county in West Texas (before air conditioning or paved roads), W.A. Grieve-Smith tried to obliterate the Great Depression and Dust Bowl by immersing himself in Greek, Latin, Spanish, French and German literature and language study, winding up in the same class as Dr. John Nash at the Princeton Graduate College. Moving to New York, he began writing and producing ads in the fledgling TV medium. For the following 35 years, he recorded sound for commercials, documentaries and features. With the demise of New York film production he switched to teaching at New York University’s Continuing and Professional Studies program, where he initiated the course in location sound recording. During this string of day jobs, he has maintained a lively interest in recordings of Renaissance and Baroque secular and liturgical music. Howard Stokar is curator and Producer of the CooperArts Series at The Cooper Union in New York. He is also Music Producer for Works and Process at the Guggenheim, and runs a management firm for composers, Howard Stokar Management. Ralph Glasgal is a noted authority on data communications and digital networks, and has written three books and many articles on these subjects. Founder of the Ambiophonics Institute, he invented Ambiophonics in 1987 — conceived to provide concert-hall realism in the home primarily from existing recordings of classical music. Has written many AES research papers on psychoacoustics and sound recording / reproduction, as well as a book, Beyond Surround Sound to Virtual Sonic Reality (serialized on stereotimes.com). He has published many articles about high-end gear in Stereophile, Audio, The Audiophile Voice and Audio Video Interiors. Glasgal Island, just off the coast of Antarctica, has been named for him (to honor a 1957 / 58 expedition in which he took part), and he has reached the base camps of the 10 highest peaks in the world. 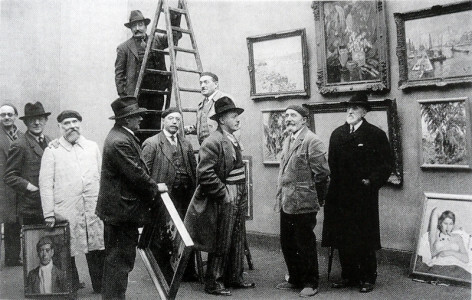 The photo is of the hanging committee at the Salon des Artistes Rouennais, Musée des Beaux-Arts de Rouen, 1934.